There are 39 Singers featured in the Archival Anthology who are no longer with us. Singers from Massett (23): Emily Abrahams, Nora Bellis, Dora Brooks, Percy Brown, Susan Brown, Captain Andrew Brown, Florence Davidson, Robert Davidson, Robert Charles Davidson, Louise Dixon, Amanda Edgars, Dorothy Edgars, Margaret Hewer, Chief Willie Mathews, Hannah Parnell, Selina Peratrovich, Helen Sanderson, Tina Sanderson, Ida Smith, Charlie Thompson, Emily Thompson, Joe Weir, Emily White. Singers from Skidegate (8): Lenore Heal, Gertrude Kelly, Sarah Pryce, Mary Davidson, Agnes Russ, Henry Young, John Wesley, Susan Williams. 8 Singers from Other Nations: Salish: Mary Clifton, Mary Moon; Heiltsuk: David Gladstone; Nuu-chah-nulth: Fred Louis; Kwakwaka’wakw: Tom Willie Johnson, Abia Martin, Mungo Martin, Ella Thompson. The Haida Gwaii Singers grew up hearing Haida songs sung by the Holders of Songs in their homes and at informal gatherings. Most of the archival recordings on Songs of Haida Gwaii were made in these relaxed, laughter-filled settings. Despite Canadian government laws outlawing potlatch from 1885 to 1952, the traditional songs and dances always remained part of daily social life. Today, Haida songs are once again fully interwoven with art, dance, ceremonies, feasts and potlatches, the supernatural beings and the environment. They help us to enter into a spirit state and bring to life ceremonial objects such as masks, rattles, clappers, paddles, drums, and regalia. They nourish the circle of culture, with art animating and inspiring songs and songs animating and inspiring art. Robert Davidson was born in Hydaburg, Alaska and grew up in Massett, Haida Gwaii. Robert began carving at age 13 in 1959 and his art was influenced by his father, Claude Davidson, his grandfather, Robert Davidson Sr., and his great-grandfather, the famed Haida master artist, Charles Edenshaw. In 1966, Robert apprenticed with master artist Bill Reid, learning Haida engraving and design forms. 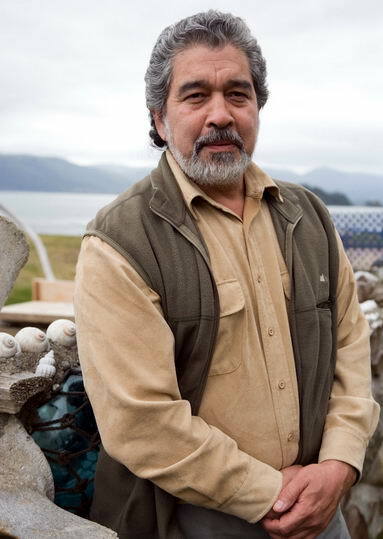 Robert has produced an internationally acclaimed body of work now found in private and public collections around the world and his commitment to excellence and the spirit of Haida art has been recognized in numerous awards and honours. He has openly connected Haida art to ceremony since 1969; he began recording Haida elders in 1969 and started publicly singing Haida Songs in 1977. In 1980, he co-founded the Rainbow Creek Dancers with artist and dancer, Reg Davidson under the guidance of their grandmother, Florence Davidson. Rainbow Creek has been performing regularly at home and abroad ever since. Guujaaw, a descendant of the Gak’yaals Kiigawaay Clan, the Ravens of Skedans, has always enjoyed a close relationship to the elders and spent much time on the land in his youth. He was the first to secure legal “standing” as a hunter and gatherer in Canadian Courts. Guujaaw worked with Bill Reid on several notable pieces, including Skidegate Pole, Raven and the First Men, and the prototype for Luu Taas. Though most of Guujaaw’s work remains on Haida Gwaii, he has totem poles as far afield as Japan and Indonesia. He participates in most of his people’s ceremonies and has travelled the coast to potlatches and events of neighbouring nations, and has circled the globe as a speaker and performer. Guujaaw continues singing, working with the younger dancers, carving and canoe building, making medicine and fighting for the land and cultural well being. Reg Davidson was born in Massett, Haida Gwaii. At 18, he began his career as an artist, following in the footsteps of many family members. As he learned more about the role of singing and dancing in Haida culture broadened his artistic creation in gold, silver, wood, print, painting, drums, and weaving. Reg particularly enjoys working in wood and has produced several poles and sculptures. His first large commission came in 1980 from Malaspina College for a totem pole for Tamagawa University of Japan. With Robert Davidson’s help, he created a 31-foot, three-figure eagle pole. Experience has deepened his understanding that “simplicity is the hardest thing to achieve”. Reg loves making art. “It is my life. I do it for my enjoyment.” Reg is also the principal dancer for the Rainbow Creek Dancers, which he co-founded with Robert Davidson. Reg has been singing and dancing since 1978 and is frequently invited to participate in potlatches and feasts in Haida Gwaii. Marianne Jones is a filmmaker, actress and creative director of Vancouver-based Urban Rez Productions in collaboration with producer Jeff Bear (Maliseet). At the 2001 Banff Television Festival, their work, Burnt Church: Obstruction of Justice won the Telefilm/APTN award for best English language production. Marianne’s ongoing involvement with Haida culture includes a 26-episode television series on Haida artists called Ravens & Eagles: Haida Art. The series was nominated for a Leo Award for best documentary in its first season, and won the 2006 IMAGenation Outstanding Independent Broadcasting Award. Her film and television roles have included a nine-season stint on The Beachcombers, as well as parts in I Heard The Owl Call My Name; McGyver; Where the Spirit Lives, Street Legal, North of Sixty and Lost in the Barrens. Marianne has been a dancer and singer with the Rainbow Creek Dancers for 20 years. She has also sewn button blankets and created a Haida bridal headpiece for fashion designer Dorothy Grant. We received many private donations, and the financial support of the Vancouver Foundation, Canada Council for the Arts, the Province of BC, Ravens and Eagles Productions, and the National Aboriginal Achievement Foundation. We also acknowledge the support of the Haida Gwaii Museum, who partnered with us to create this project.